Following her mother’s death, Ella Hostetler plans to make a fresh start and start living life for herself rather than those around her. Having auctioned off the family farm to Loyal Weaver, she moves into a flat in town and starts her job as a librarian. But Ella can’t seem to break the ties with her past as Loyal keeps trying to involve her in the renovations he’s making to her old house, and her landlady, Dorothy, starts warning her against making changes in her life. Although Ella had previously thought she was destined to be an old maid, having missed her youth due to caring for her mother, Loyal’s attention suggests otherwise. But Dorothy seems less than pleased by this new development, warning that Loyal is nothing but trouble. Is Dorothy’s possessive and controlling behaviour rooted in something more than a desire to protect Ella? And is there finally a chance for Ella to find love in her new friendship with Loyal? The second book in the Families of Honor series was very slow to start, and I struggled to get into it. It wasn’t until about halfway through the book that I felt it really got started and finally caught my attention. Ella isn’t your typical romantic heroine; instead of pining after the hero and bemoaning the lack of love in her life, she was quite independent and content to live in her little flat and work at the library. I appreciated that she didn’t fall for Loyal immediately and was content to just be friends with him. Their romance was the kind where a friendship slowly turned into something more and one day they suddenly realised how much they cared for each other. This was a refreshing change from the other Amish romances I’ve read lately. The relationship between Ella and Dorothy was quite disturbing, and initially I wasn’t sure where it was heading. In places Dorothy’s possessive control over Ella made her seem a bit caricatured, especially as her behaviour isn’t fully explained until later in the novel. However, it was interesting to read about a friendship riddled by jealousy that wasn’t rooted in something as simple as a feud over a boy, but a long-term hurt that had never been let go of. I’ll admit that this storyline still seems a bit bizarre to me, even after finishing the book, but it wasn’t something that I’d ever seen featured in an Amish novel so Shelley gets credit for trying something new. If you’ve read the first book in the Families of Honor series, you’ll be pleased to get the chance to catch up on the characters from The Caregiver. Loyal’s Uncle John features throughout the novel, now working at the local coffee shop, and we witness him trying to choose between two very different women, one Amish and one English. Mattie and Graham, who will be the focus of the final book in the series, pop in and out of the story and give us the chance to see how Mattie is recovering from her chemotherapy. Lucy and Calvin also appear a couple of times, as well as Katie, the youngest sibling in Calvin and Loyal’s family. A few chapters in the book are told from Katie’s perspective, which took a while to get used to but was a nice touch. My only complaint with Katie would have to be that, on occasion, her speech did not sound like that of a five-year-old. Sometimes Shelley captured her voice just right, but at other times Katie would utter a sentence that seemed far too mature. While I wouldn’t class Shelley Shepard Gray as one of my favourite authors of Amish fiction, I’ve also never read a novel by her that I’ve disliked. She’s an author who manages to consistently produce entertaining and enjoyable novels. Although I don’t always connect with her characters as strongly as I do in other Amish novels, her books contain all of the elements that fans of this genre are looking for. 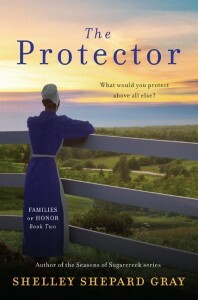 If you’re a fan of Shelley Shepard Gray, you won’t be disappointed with this addition to her Families of Honor series. Review title provided courtesy of Avon Inspire.